What do you visualize when you hear “Cuba”? Powder soft white sand beaches? Funky old cars in Havana? Brightly coloured dressed locals? Or perhaps it’s the teal water of the ocean gently lapping at your toes. Whatever it is that appeals to you, Cuba is a fabulous destination and The Travel Desk’s feature spot this month. Most sun suppliers offer non-stop flights to a variety of destinations and flying time is approx. 6 hours. Canadians need a passport and a tourist card (supplied by airline) to enter Cuba, and can bring Canadian currency down to convert to the Cuban Pesco. Despite rumors, USD is accepted in Cuba, however if you are converting it to the Cuban Pesco they do charge a surcharge. Havana: With its vintage American cars, wooden bars, and salsa music, Havana is one of the world’s most intriguing cities. Explore Old Havana with its narrow streets, baroque churches, and cobbled plazas. This UNESCO-protected 500-year old quarter is a joy to explore. Havana can be done as a day trip from Varadero, or explored on it’s own. 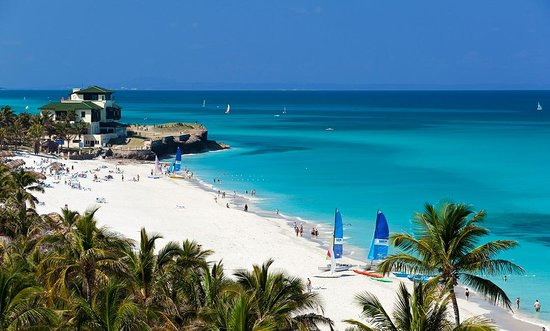 Varadero: Some of the best beaches in the Caribbean are found here, and even though there are multiple resorts, they are stretched out and are very seldom crowded. 20 km of white powdery soft sand, enjoyed while sipping your mojito and listening to the water lap along the shoreline. Varadero is the most common destination for Western Canadians and excursions to Cardenas and Matanzas and Havana are possible, all known for art, history, culture and nightlife (Havana). Cayo Coco: An island of 17 kms in length, connected to the mainland by a man-made roadway. The primary attraction of this paradise is the spectacular beach, the breathtaking scenery and the joy of simply doing nothing. Enjoy silky white sand beaches and crystal clear water. The island is an environmentally protected area, home to the coco bird which gives the island its name. A coral reef runs along one side of the island, offering wonderful opportunities for snorkelling & scuba. Holguin: Pristine beaches and azure waters line the coastline. Located approximately 50 kilometres from the capital city of Holguin, Guardalavaca offers visitors a stunning beach setting along a 1,200 meter long bank of the Cuban seashore. This area is also well known for it’s scuba diving sites and ecotourism opportunities for those adventure seekers.